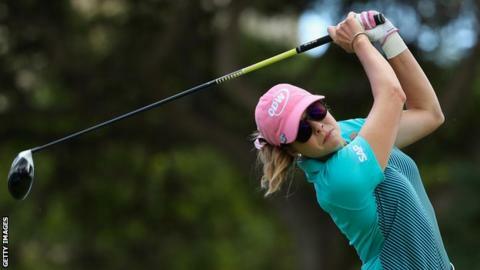 South Korea's Mi Hyang Lee and American Paula Creamer are tied for the lead at the Lotte Championship after a rain-interrupted first round in Hawaii. The pair finished on six under par after play was suspended for 44 minutes in the afternoon because of heavy rain. Wales' Becky Morgan is tied for eighth on four under while England's Bronte Law is a shot further back. Two groups will finish their first rounds on Thursday after darkness saw play end prematurely. New Zealand's world number one Lydia Ko hit three bogeys and two birdies in a one over par round, leaving her seven shots off the lead. South Korea's So Yeon Ryu is currently four under and will replace Ko at the top of the rankings if she wins and the New Zealander finishes fifth or worse.